We already offered our early impressions of The Mighty Quest for Epic Loot earlier this month , but now you have the opportunity to see the game in action thanks to a new gameplay trailer. 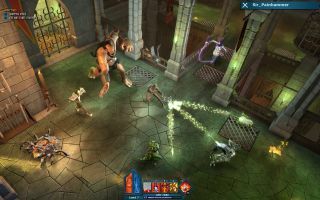 The Diablo / Dungeon Master hybrid doesn't have a release date as yet, but the free-to-play title is currently in closed Alpha, so it's probably not far off. The video demonstrates character customisation, castle building and combat, as well as the jolly, self-referential humour that will hopefully set Might Quest apart from some of its very obvious influences. Of course, one of the game's selling points are the user generated dungeons, which you can read more about in this preview .